Sometimes it's not all about the distance. Today I had a flight which will be ranked way up there with my most memorable flights. After last weekend flight when I turned over Chabot in the Oakland Hills I made up my mind to try one day to continue this route all the way to the Golden Gate Bridge. This requires a very unusual day, unstable, with reliable lift which can allow safe flying below the 4000 feet floor of class bravo. Today was the day. I made up my mind in the morning to give it a shot and talked Buzz to join me. And indeed, Buzz and myself made it from Byron to the Golden Gate Bridge and some more! We went from Byron to Oakland Hills, Tilden Park, Berkley, crossed the bay just north of the Bay Bridge and the Golden Gate Bridge to Sausalito while staying below class Bravo (and getting as low as 2300 feet over the bay! ), over the Ocean to Mt Tam, Navato, Sonoma, Napa, back to Mt Diablo and an unexpected 5 knots wave to 10,000 feet in less than 15 knots wind, then south to the Diablo Range and back to Byron. The view was spectacular and a video will follow. 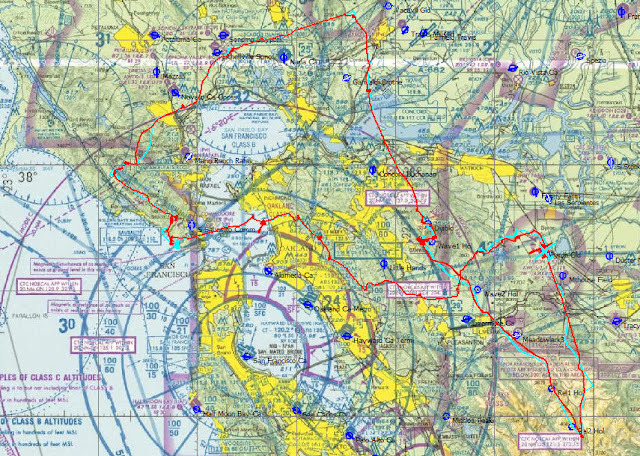 But it wasn't just a spectacular flight, it was over terrain which I never flown before (and I wonder if any glider flown this route before), and it was the first time I flew with another glider (BG) from takeoff to landing without loosing sight of each other for the whole flight. I doubt any of us would have attempted it alone, but flying together is easier, more fun and more encouraging.